This isn’t what I wanted, and this wasn’t what I was promised. Allow me to begin by telling you that this film is an elaborate troll. Ever since the promotional campaign for this film began, it has all been culminating to the biggest troll moment in the Marvel Cinematic Universe thus far. We were promised the darkest, grandiose installment to the Iron Man series thus far to conclude the trilogy with a bang. Most trilogies do promise this, and even if the films themselves aren’t good (Spider-Man 3, The Dark Knight Rises), they at least knew not to go out on a whimper. Iron Man 3 begins in 1999 with a flashback establishing the theme of “creating our own demons” in a silly attempt to connect with the themes of the prior two films. Tony Stark (Robert Downey Jr.) does this by brushing off a disabled scientist named Aldrich Killian (Guy Pearce) for a one-night-stand with scientist Maya Henson (Rebecca Hall), inventor of a regenerative treatment known as “Extremis”. The film then fast-forwards to sometime after the events of The Avengers. Since then, Tony has been suffering from anxiety attacks that have cost him his sleep. Out of fear of losing the one thing he can’t live without, Pepper Potts (Gwyneth Paltrow), he has dedicated all of his time to the creation of dozens of new armors in case alien forces ever return. 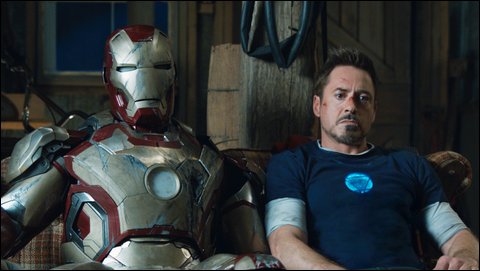 While this could have been an effective obstacle for Tony’s character, his anxiety is mostly played for laughs, and his relationship with Pepper rarely feels sincere. And what it all culminates to is laughably horrendous. Meanwhile, a terrorist under the alias of “Mandarin” (Ben Kingsley) is terrorizing the globe, raising global tensions and confusion at the lack of forensic evidence. When Happy Hogan (Jon Favreau) is seriously injured in one of the Mandarin’s attacks, Tony openly challenges the madman, going so far as to give him his home address (yes, he tells a terrorist where to find him, his armors, and his beloved girlfriend). As you’d expect, his home is decimated, and Tony is forced to flee, believed to be dead by the world. When Colonel Rhodes (Don Cheadle) also finds himself entangled in the hunt for the Mandarin, it’s up to Iron Man and the newly named Iron Patriot to stop this ominous threat. I’m just going to come out and warn you—the Mandarin is a dividing character. You will either loathe him, or hate what the film does with him. That’s all I’ve to say on his character. Our other villain, Aldrich Killian, is quite bad, with motivations that are as superfluous as his aspirations. He’s not a strong enough character to compensate for what I believe to be a terrible representation of the Mandarin. The film is also crippled by an embarrassingly inconsistent tone. Everything, no matter how dramatic it may be for the characters, is played for laughs. It’s ironic how dramatic this movie was promoted to be, and yet every time there’s a chance for some really strong pathos, the movie shoehorns in some witty dialogue. There really is no other way to explain what this is, save for a big troll. Everything about it. The villain isn’t take seriously, the hero is never tried by fire (he’s a quitter), there’s no gravitas… it’s just a mess. Almost a subversion of what you’d expect from a film like this. If that’s what you want, you’ll enjoy this movie. But if you go in wanting and expecting what you’ve been promised? I’m sorry. This is worse than Iron Man 2.